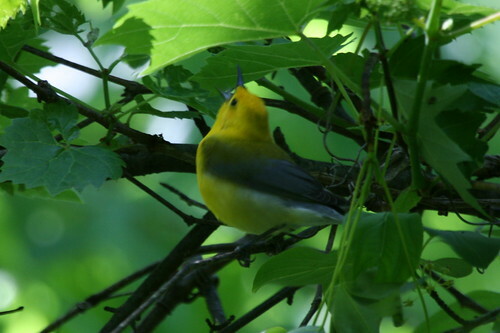 Prothonotary Warblers (Protonotaria citrea) are one of the few songbirds to nest in cavities. They inhabit much of the southeast and Great Lake states and nest in swampy forests. Their mangrove wintering sites along the coast of Central and South America are rapidly decreasing. 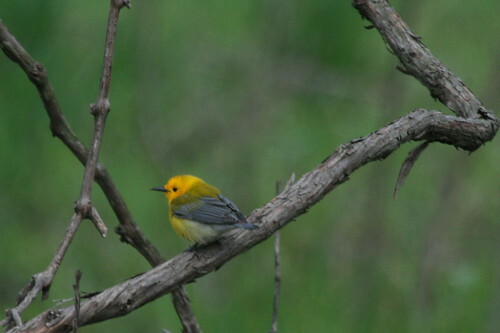 In northern Illinois, Prothonotary Warblers are uncommon but found yearly along riparian areas. I find some nearly every year, although oddly not this year perhaps because of the lack of rain and not searching the right spots at the right time. Partners in Flight along with other conservation organizations such as Mississippi Valley Joint Venture, U.S. Fish and Wildlife Service Partners for Wildlife Program, The National Resources Conservation Service Wetland Reserve Program, Ducks Unlimited, and the Nature Conservancy have taken up efforts to increase acreage of proper habitat. Other organizations on the wintering grounds have been limited and stricter laws and enforcement of those laws are needed. Over the years I have been tracking Prothonotary Warbler sightings to work on finding nesting locations (zero birds this year). I've found a few spots that would be great for increased monitoring and adding nest boxes. It would be awesome to create a nest box program similar to what has been done for Eastern Bluebirds. However, according to the Birder's Conservation Handbook, nest boxes have "increased local densities of breeding birds, though there is concern that birds breeding in nest boxes may have increased rates of nest predation". 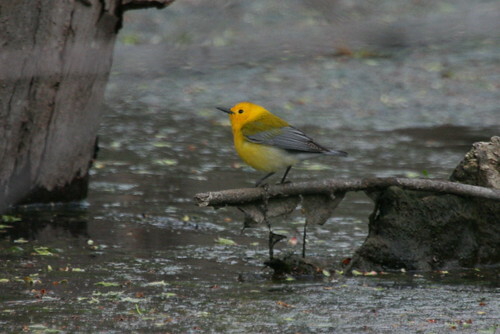 As of 2004, Prothonotary Warbler population was estimated at 1.8 million (39% decline since 1966). Full details on this species and 99 other North American birds at risk can be found in Jeffrey V. Wells' Birder's Conservation Handbook. We had two vagrant Prothonotary Warblers in Utah this last year. I was delighted to see one and add it to my life list, yet at the same time it makes me wonder. Is vagrancy an indication that all is not well in that historical range? Beautiful bird! I have had the pleasure of observing Prothonotary Warblers before and they are quite stunning. Unfortunately, I did not have a single sighting this year. I do hope the organizations you mentioned above will have success in increasing the population of these lovely birds. What a great looking bird. It seems to have a very large beak for a bird of its size. The kookaburra famously made it into a number of Tarzan films as well! Thanks for the wonderful comments! I am uncertain if vagrancy is an indication of a problem in their range. I would guess that large scale population changes (or higher numbers showing up as vagrants) would be more telling. I have noticed more of these birds are found along migratory hotspots along Lake Michigan (Chicago area) but I think that is more a result of higher number of birders searching smaller plots of habitat. The places I search for Prothonotary Warblers requires hiking a couple miles and battling hordes of mosquitoes. Greetings from Montreal, Canada. Your photos are absolutely stunning! Fascinating post and photos! 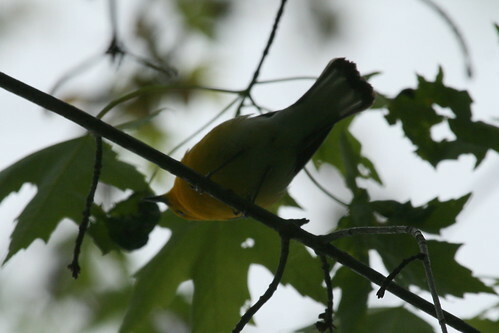 This past spring at the Cape May Birding Festival I was set on seeing a Prothonotary Warbler, but luck would have it I always just barely missed it. It was like chasing after a ghost.